What are the Educational Spots? We have always needed your help. Our mission’s work survives because of your generosity. At this moment, we need you more than ever. December contributions were 33% lower than last year. We are not asking you to give more, though it would be wonderful if you can. We do ask that, if possible, you interest a friend in helping out. And we ask that you pray that those who are capable of giving more will be inspired to do so. If you have visited our facility, you know that it’s bare of extras and frills. With 15-inch-thick walls in both our volunteer dormitory and studio, we have saved, literally, almost a million dollars in fuel oil costs over the past nineteen years. (If you were part of constructing our new, energy-efficient buildings in 1991 through 1993, we continue to remember your goodness with prayer.) To use the old saw, we pinch pennies until Abraham Lincoln gets a headache. It is difficult for us to ask, but we do need a bit of extra help right now. We thank you most sincerely for your kind support and especially your prayers. You remain in ours. May God be in your life with abundance. May He fill you with peace and joy. GOVERNOR SEAN PARNELL (left) poses in KNOM Studio C just before an interview by Laureli Kinneen and Paul Korchin (off camera). 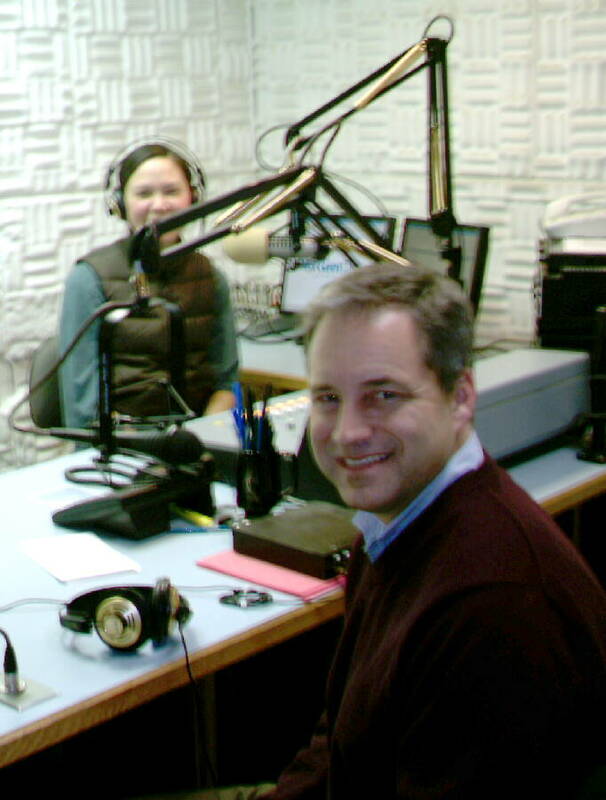 For isolated western Alaskans, KNOM interviews and call-ins with Alaska leaders offer unique opportunities to learn their views on issues that are important to the road-less Alaska bush. As often happens to visitors to Nome, Governor Parnell was pinned down for a day by a brutal blizzard that shut down air travel to the outside world. The oldest Catholic radio station in the United States, beaming education, information and inspiration to villages and remote points throughout 100,000 square miles, thanks to you. INSPIRATIONAL SPOT: Prayer and worry, like oil and water, simply do not mix. God always gives us strength enough to bear our troubles one day at a time. 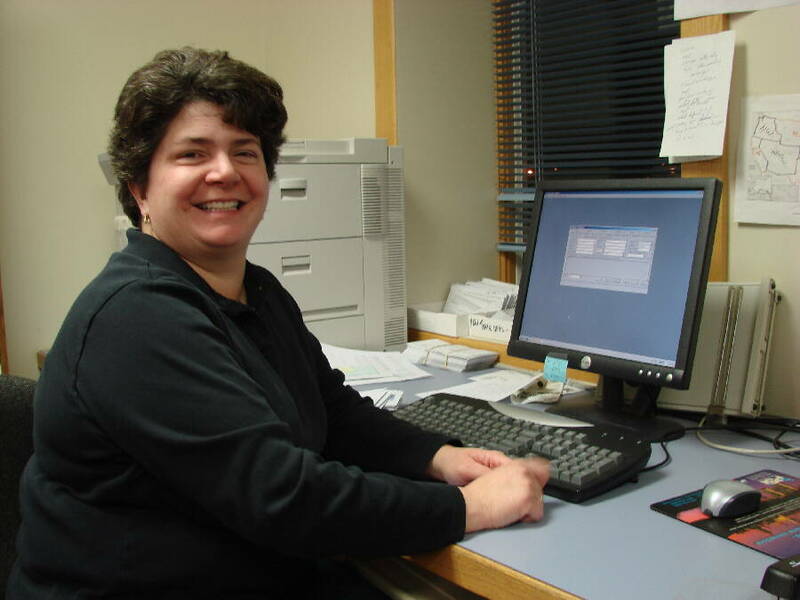 SMILES: (left) In the KNOM office, you’ll often find business assistant Betsy Brennan has a good word. Betsy served as a KNOM volunteer between 1988 and 1990. She and husband Mike, who is an Alaska Fish and Game pilot/enforcer, have two children, who sometimes have fun coloring or playing games while their mom opens the mail. WHAT ARE THE EDUCATIONAL SPOTS? Half of the 68,000 spots we air each year are educational. Most are recorded at the station. 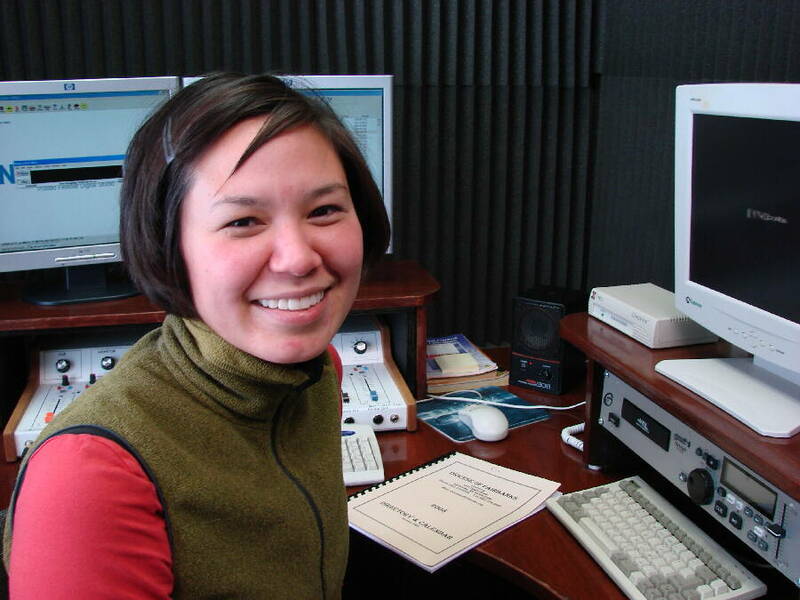 Here’s an example of an “Alaska Science Forum” spot, re-written for radio and voiced by Tom Busch from information provided by Alaska’s Geophysical Institute, then produced by volunteer production director Linda Maack. The series has aired continuously since 1976, a fascinating and popular 34-year run that shows no sign of ending. “Washboard roads are a familiar part of the northern scene. The corrugations develop most easily on dry, dusty roads. It starts at a point where a rolling wheel strikes an irregularity on the surface. The irregularity might be a dip, a bump or a small rock. “The irregularity causes the wheel to fly upward, and when it lands, it digs in to create another irregularity. The wheel climbs out of the new irregularity and lands again, creating a third. “And so, a single irregularity leads to the formation of others that are evenly spaced. (Left) Prior to 1994, our educational and inspirational spots were all on tape cartridges. For the past 16 years, they have been files recorded into computers. This screen depicts some of KNOM's inspirational spots last autumn, as sorted by the computer. OTHER EDUCATIONAL SPOTS this past month dealt with weather facts, drugs, tax credits, whales, pike fish, fire safety, frozen pipes, world geography, smoking, child abuse, mental illness, suicide prevention, diabetes, depression and light, foster care, Alcoholics Anonymous, history, and many more subjects, entirely thanks to you. Thank you! INSPIRATIONAL SPOT: Abraham Lincoln failed in business twice. He was defeated when he ran for public office, not once or twice, but eight times. Then he suffered a nervous breakdown. Eventually, he was elected President of the United States. Success is to be measured not so much by what we achieve, but the obstacles and hardships we’ve had to overcome to get wherever we are. BRR! 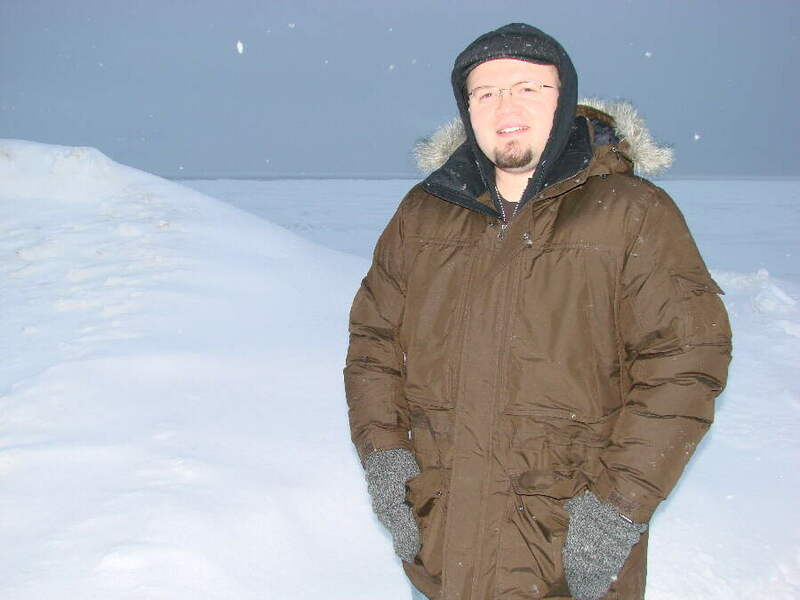 (left) In early December, friendly and hardworking volunteer news reporter John Francis stands by the frozen Bering Sea. About two years ago, John opened a web design company in Russellville, Arkansas. After finding an article featuring KNOM, he applied for a volunteer position and was accepted. The frozen Bering Sea is behind John. At the horizon, you’ll see a dark patch of water that was unfrozen. By the time you receive this, it will be frozen, probably about ten inches thick. Laureli (left), who is half Inupiat (in-OO-pee-at, northern Eskimo) and half Yup’ik (YOO-pik, southern Eskimo), grew up in Unalakleet and joined KNOM as public affairs director in September 2008. GREETINGS! In 1996, Tom Busch hosted what was planned to be a two-hour Christmas greeting program. 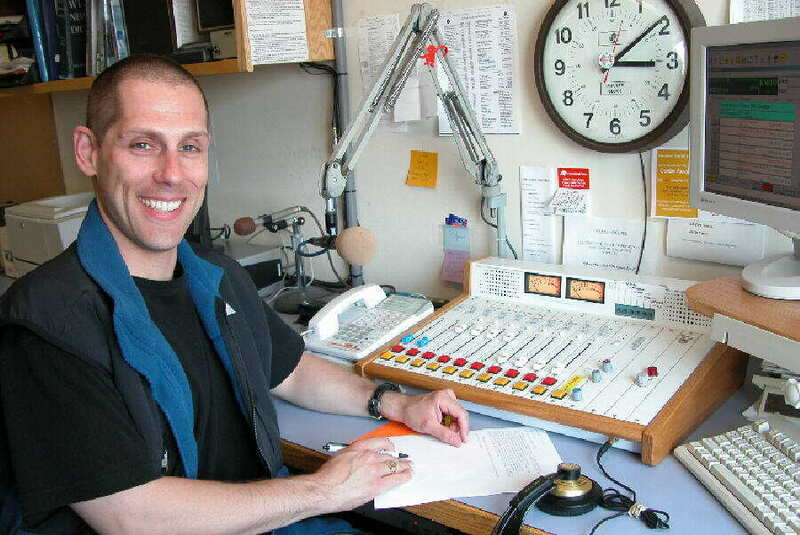 After two hours, the phones remained lit, and he and then-program director Ric Schmidt decided to continue the show. While the calls didn’t let up, everyone was exhausted, and Tom ended the call-in after seven hours. "Tired, I left for the town's drug store to buy an aerator for our kitchen faucet," Tom remembers. "In the store, the best I could manage was 'um, in the place we make food, there's a water thing...' I couldn't talk!" The tradition continues. 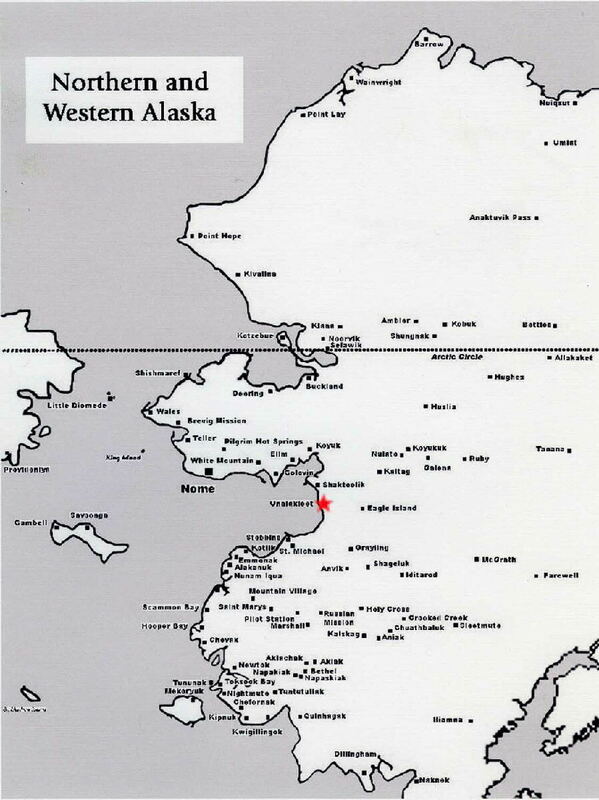 During the 2009 special, about 500 people from Nome and 39 other communities offered wishes to perhaps 10,000 people. Whew! (Left) As part of our Christmas festivities, the local high school's Spanish club sang carols, some thirty students strong, possibly the largest crowd our studios have ever accommodated at one time. 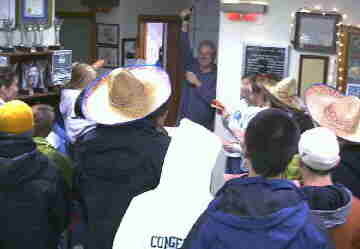 From the entrance to Studio A, now general manager Ric Schmidt holds the microphone, as the youngsters sing in the reception area. In the background, you can see a few of KNOM's many awards. “WEATHER OR NOT:” It’s been an extremely mild winter so far, with a low temperature of only –19�. It could be in the forties below, and the wind chills have dropped not much below that, unusually warm for this time of year, with numerous major storms. With blizzard warnings and watches, Christmas week, KNOM’s hourly weather forecasts were over eleven minutes long! Please consider adding the KNOM radio mission to your will. We prayerfully place all bequests into funds that will protect the mission in future emergencies, and provide for major improvements. INSPIRATIONAL SPOT: When you walk in deep snow, it’s always easier if someone is walking ahead of you. Christ walked ahead of us on this earth, loving and giving and even suffering, so He understands how tough the trail can get. It’s important to stay on that same path of loving and caring that He did, or we won’t have His trail to guide us. INSPIRATIONAL SPOT: Can you imagine what would happen if I were to spend the same amount of time, energy and interest on my soul as I do for my body? One lasts a few years, the other forever. If someone made a study of my life and saw how much attention I gave to each, which one would they think I considered immortal? GOOD AND FAITHFUL SERVANT: (left) We are deeply saddened by the departure of Paul Korchin, KNOM volunteer news reporter 1987-1989 who returned as news director in 1997. His specialty has been in-depth reporting of issues that affect western Alasks every day—poverty, suicide, the collapse of fishing, by which many attempt to feed their families year-round, the high cost of energy (heating oil at $10 a gallon in some villages), child abuse, the high rate of accidental deaths. . .the list goes on. Paul is engaged to a woman for whom working in Nome is not a career option. He will be greatly, greatly missed.In December, Laureli Kinneen assumed the position of news director, and in a money-saving move, her previous position as public affairs director is being retired. Please join us in continuing to pray for Paul and his soon-to-be wife, won’t you? God be with you, Paul! FORTY YEARS AGO: In January and February 1970, Brother John Huck, SJ is in Nome, joined by volunteer master carpenter Tom Karlin and assistant, Leigh Birkeland. Anticipating a crowd of volunteers to staff the future Catholic radio station, Karlin completes a large dinner counter that is sufficient to feed nine or ten people. 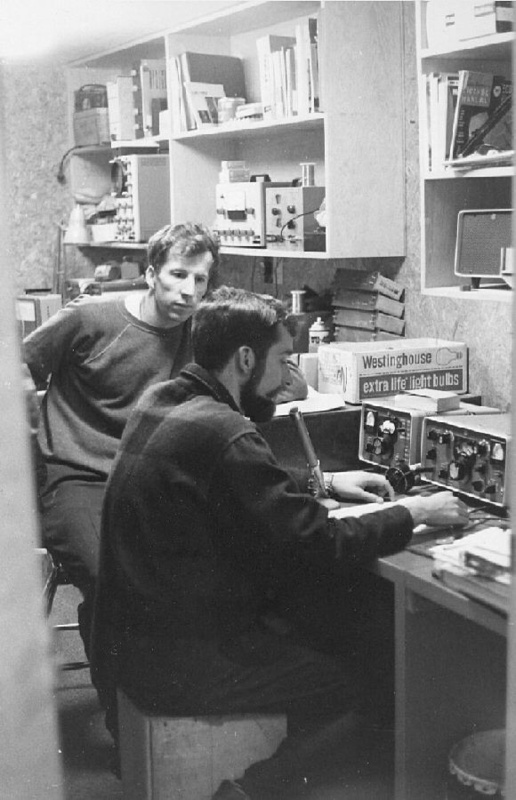 (Left), in this undated picture, probably from spring 1971, volunteer and amateur radio operator Alex Hills makes contact with a Yakima, Washington ham, who by telephone puts Bro. John Huck, SJ, in touch with his mother. In January 1970, there is still no word from the Federal Communications Commission on the future station’s application for construction, which is held up by complications caused by pending Alaska Native land claims legislation. Again, we thank you, we honor you, we pray for you. It is thanks to you, and good people like you, that our popular mission signal has been a staple in the lives of thousands of isolated Alaskans every day for more than 38 years. Once more, we pray that God greatly blesses you!